The Vedic literatures are not manmade. Rather, they are coming down to us through the traditional process, through hearing. For example, we accept the identity of our father by hearing. A child is born, and when the child hears his older brothers and sisters calling a gentleman “Father,” he also begins to say “Father.” There is no question of studying. He learns simply by hearing. Others are calling “Father,” so he also calls “Father.” There is no need at all for evidence or studying. Similarly, the Vedic knowledge has come down to us through the process of hearing. Before five thousand years ago, there was no need of having the Vedic knowledge in book form, because the spiritual master would speak it, his disciple would hear it, and the disciple would speak this knowledge to his disciple, who would in turn hear it and hand it down—and so forth, through the generations. But when the Kali-yuga (this present age of hypocrisy and confusion) began five thousand years ago, all of the Vedic knowledge was systematically recorded. Earlier there had been only one Veda, the Atharva Veda. But to make it more clear and understandable, Vyasadeva divided the one Veda into four and entrusted four of his disciples to take charge of the four Vedas. Later he wrote the Mahabharata and the Puranas (histories) just to make the Vedic knowledge still more understandable to the common man in different ways. But the principle is the same. Veda-sastra kahe-‘sambandha.’ Sambandha: we have to find out how to reestablish our lost relationship with Krsna, or God. And what is that relationship? As the Vedanta-sutra says, janmady asya yatah: our relationship is that all beings—including ourselves—are born of the energy of God. Therefore we call God “Father.” This is accepted in every religion. There is no argument. So what is the relationship between father and son? Is the relationship only to exact from the father? No. There is duty. But if somebody teaches, “My dear boys, take LSD, become mad, and go to the lunatic asylum,” he will be very popular. What can be done? This is the situation. So we are situated in a society of the lowest of mankind. Always remember this. I am not just speaking about the United States, but all over the world. Even in India, where so much culture is available for understanding God, their foolish leaders are also teaching this gross materialism. You see? It is because of the age we are living in. Don’t think that I am criticizing some particular country or community. This is the age of Kali, the age of hypocrisy. Simply hypocrisy. Bhayam dvitiyabhinivesatah syad isad apetasya viparyayo ‘smrtih: we are put into anxiety because we have taken an opposite position—” Who is God?” Viparyayo ‘smrtih. This very word is used. Viparyayah means “topsy-turvy.” Our memory has become topsy-turvy, and therefore we are suffering. But people will not admit it. “No, we shall adjust. We shall make better laws. We shall offer higher education. We shall form big political parties. We shall go on defying God. And we shall be happy in this way.” So this godless civilization is now generating the Communist party, bringing us to a dangerous situation. But one who takes shelter of Krsna will not be put into danger. Rest assured. Vasudevah sarvam iti sa mahatma sudurlabhah: We have to become great souls by reviving our eternal relationship with the Supreme, by surrendering unto God. That surrendering process is bhakti, or devotional service. For so long we have been disobedient. Now we have to become obedient. That’s all. As soon as the people of this so-called advanced world become obedient to God, then there will be discipline, and there will be peace. There is no discipline now. No one is agreeing to follow any spiritual rules or regulations. Everyone has become God. “We can do anything—whatever we like.” That means that everyone has become dog. But bhakti-yoga, devotional service, means that we follow a disciplinary pattern in our lives, so that automatically we can revive our lost relationship with the Lord. And then we will become happy. We will realize love of God, the real goal of life. Why practice discipline? Suppose we don’t revive our relationship? Then we’ll be disturbed. We are searching after peace and prosperity. So what is the basis of peace? The basis of peace is love. Do you think that you can go without loving anyone and still become peaceful? No. How is it possible? But if you love God, then you can love everyone. And if you don’t love God, then you cannot love anyone. Because He’s the center. Take this example. Say a girl belongs to a certain family. But when she marries, she becomes a member of her husband’s family. Because the husband and wife are now related, at once she becomes related to the husband’s brother. She becomes related to the husband’s mother and the husband’s father. She becomes related to everyone in the family. At once. Of course, the central point is the husband. Before that—before any connection with that central point—that boy’s mother, father, and brother had no relation with this girl. You see? So the central point must be there. If you can love God, then you can love everything in relationship with God. You can love every man. You can love your country. You can love your society. You can love your friend. Everyone. That is the point. People are thinking in a different way: “Why shall I love God only? Why shall I love God? I shall love my family. I shall love my country. I shall love my . . .” But no, you cannot love all of these things. It is not possible, because you are missing the central point. These are facts. Harav abhaktasya kuto mahad-guna. However materially or academically qualified he may be, one who does not love God cannot have any good qualifications. Why? Manorathenasati dhavato bahih—because he’ll simply speculate on the mental plane and fall under the spell of the material energy. But it is clearly stated in the Srimad-Bhagavatam, yasyasti bhaktir bhagavaty akincana—as a person becomes advanced in devotional service, automatically he develops all good qualities. The Caitanya-caritamrta gives a list of twenty-six qualities of a devotee: (1) He is very kind to everyone. (2) He does not make anyone his enemy. (3) He is truthful. (4) He is equal to everyone. (5) No one can find any fault in him. (6) He is magnanimous. (7) He is mild. (8) He is always clean. (9) He is without possessions. (10) He works for everyone’s benefit. (11) He is very peaceful. (12) He is always surrendered to Krsna. (13) He has no material desires. (14) He is very meek. (15) He is steady. (16) He controls his senses. (17) He does not eat more than required. (18) He is not influenced by the Lord’s illusory energy. (19) He offers respect to everyone. (20) He does not desire any respect for himself. (21) He is very grave. (22) He is merciful. (23) He is friendly. (24) He is poetic. (25) He is expert. (26) He is silent. After all, what is the meaning of Krsna consciousness? Is it just some kind of sentiment or fanaticism? No. It is a science. If you follow the rules and regulations, then automatically all these good qualities develop. You can actually see. And as soon as these qualities are there, then you actually become a lover of your country; you become a lover of your fellow man. You become a friend to everyone, a lover of God—everything. So just imagine if each and every person became like that…. Of course, it is not expected that each and every person will become like that. However, if only ten percent of the world’s population becomes Krsna conscious, then it is guaranteed that we will have peace in the world. Why? Because ekas candrah—we do not require many moons in the sky. One moon is sufficient to drive away the darkness. Varam eko guni putro nirgunena satena kim. Canakya Pandita says that it is better to have one qualified son than to have hundreds of fools. The modern civilization is going on in that way—godless civilization. But if some percentage of the civilized human beings become Krsna conscious, that will bring world peace. Otherwise it is not possible. Krsna consciousness is therefore a necessity. When Lord Sri Krsna Caitanya appeared in India five hundred years ago, He based His teaching on this principle: prema pum-artho mahan—He stated that the objective of human life is to attain love of God. That’s all. That makes one’s life perfect. Nothing more. One of the great spiritual masters, Srinatha Cakravarti, has described the mission of Lord Caitanya. Aradhyo bhagavan vrajesa-tanayas: Krsna, the Supreme Personality of Godhead, is aradhyo, or worshipable. He’s the only worshipable personality. Tad-dhama vrndavanam: and as Lord Krsna is worshipable, similarly His place of pastimes, Vrndavana, is also worshipable. And what is the best kind of worship for Krsna? Ramya kacid upasana vraja-vadhu-vargena ya kalpita: the highest kind of worship is what was demonstrated five thousand years ago by the cowherd damsels of Vrndavana village. They were always thinking of Krsna. When Krsna went walking outside of the village, they were at home thinking, “Oh, the soles of Krsna’s feet are so soft. How can He wander in the forest, where there are so many particles of stone? He must be hurting Himself.. Krsna was in the forest, and they were at home. 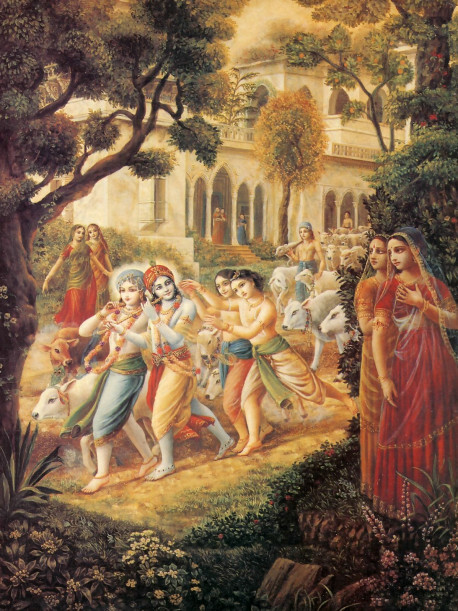 But they were thinking of Krsna—how He was walking, how His soft feet might have been suffering. In this way they were always absorbed in Krsna consciousness. The cowherd damsels were not Vedantists, they were not brahmanas, they were not educated—they were cowherd girls. But their love of Krsna was so intense that Lord Caitanya stated, “There is no better worship than what was demonstrated by the damsels of Vrndavana. Then what is the source where we can gain an understanding of Krsna? Srimad-bhagavatam pramanam amalam: if you study Srimad-Bhagavatam, then you attain all these things. You attain perfect love of Krsna, life’s highest success. So here is the book—Srimad-Bhagavatam. And here is the ideal worship—that of the damsels of Vrndavana. And the worshipable object—Krsna. And the prime necessity of life—to attain love of God. Sri-caitanya-mahaprabhor matam idam: this is the sum and substance of what Caitanya Mahaprabhu taught. Dharma: every civilized nation has some sort of religion, or dharma, because unless we become religious there is no possibility of artha, lasting peace and prosperity. Dharma-artha: if all people are religious, then their economic condition will be better. And why is a better economic condition desirable? Kama. Kama means that the necessities of your life will be fulfilled nicely. Dharma-artha-kama. Then, what is the ultimate goal? Moksa. If you live peacefully within society, then you can cultivate knowledge for your liberation. Dharma-artha-kama-moksa. So, generally these four principles are the aim of human society. Lord Caitanya says, “Yes, these are not bad” But prema pum-artho mahan—”You may have all these things, but if you have no love of Godhead, then it is all nonsense. All nonsense. Therefore try to love God, and everything will be all right.” Lord Caitanya says that we should understand our relationship with God and act accordingly. That means serving Him with devotion. Then we shall have the highest perfection of life—love of God—and our mission of human life will be fulfilled.